Everyone at some point in time has had something go wrong in the kitchen... wether it's mistaking salt for sugar, burning the crap out of ____ , having the lid of a spice bottle pop off and DUMPING way more of an ingredient into the pot; we've all been there. In my family we have more than a hand full of these stories. The time the turkey was still frozen at Thanksgiving and we ended up eating dinner at 10:30. The time the ham gravy was way too salty (in a family of salt ADDICTS). Burning the garlic bread EVERY time for about a 2 year stretch. The time I used 2 TBSP of salt instead of tsp's in my chocolate chip cookies... the list goes on. My best food blooper was when I was learning how to cook spaghetti sauce a.k.a. bolognese/marinara (mine is a bit of a combination between the two). I had cooked the sauce with my mom for years, but I had never made it from scratch on my own. The last time my mom and I cooked the sauce together I had her give me exact instructions so I could do it on my own the next time around. About a week later I decided I would surprise my parents and cook dinner for them. I grabbed all the herbs, garlic, cans of tomato, and pasta I needed to make the dish. I browned my ground beef like a champ, barley shed a tear when I chopped my onion, I was so proud of myself. I dumped in my spices and then added my cans of tomato. I even found an open bottle of red wine and added a few glugs remembering that my mom told me it added great flavor to the sauce. How many 12 year olds cook with wine?! This girl did! When my parents walked in the door I was elated to tell them I had cooked dinner for them. We finally sat down to the table and I served my family the meal I had prepared. Spaghetti and sauce, garlic bread, and salad. As my parents took their first few bites they both looked at each other with a strange smile. My mom inquired what I had used to create such a fabulous sauce. So I went through the ingredients... garlic, onion, italian seasoning, oregano, basil, taragon, onion powder, garlic powder, wait?! TARAGON? YES, I put taragon in my spaghetti sauce. I didn't know herbs. I just knew there were A LOT of dried green spices that went into the pot. My dad got a good chuckle and said "Ah yes, taragon in spaghetti sauce", or something of that sort. To this day it is still my biggest kitchen blooper and one I will never live down. You can't take cooking too seriously. Accidents happen, we make mistakes. Don't get defeated when you mess up a recipe. It is NOT the end of the world! Even the most famous chefs have stories like these. It's how we learn and grow as cooks. I'm sharing this recipe with you as a request from my good friend Chris. 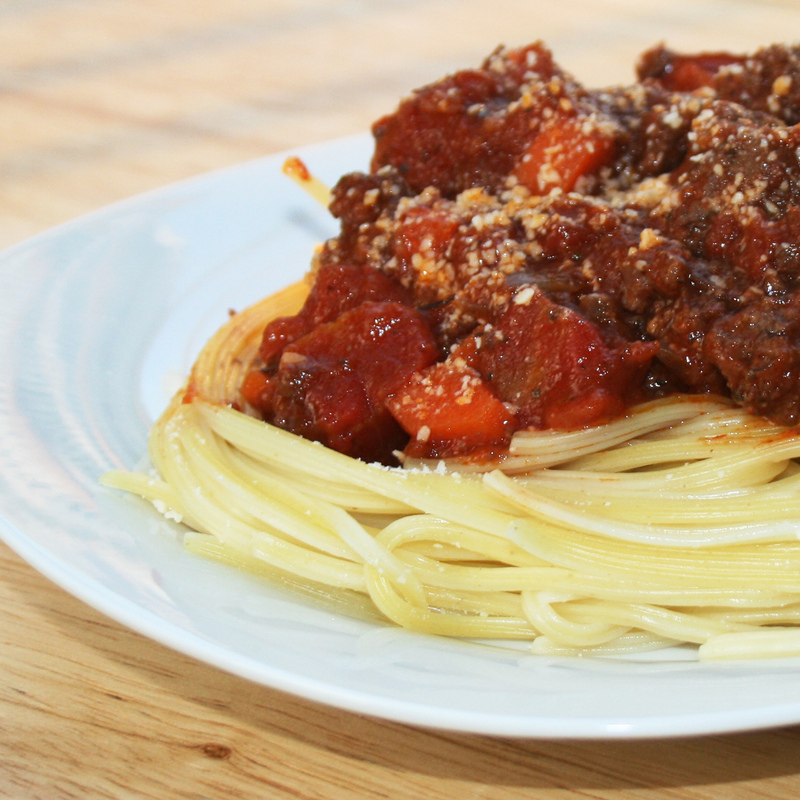 Spaghetti sauce is one of the easiest things to make and it freezes really well. It's SO much better than any jarred sauce and it only gets better the longer it sits. I think it hits its peak of tastiness at 2-3 days leftover.I hope you enjoy my tarragon-free spaghetti sauce! In a large sauce pot put enough olive oil to coat the bottom of the pan in a thin layer. Once hot, crumble ground beef and let it brown. If your pot isn't very large, you can brown your beef in 2 batches. If you put too much meat in the pan, it will steam and turn grey. This isn't the end of the world... but the browning process will add more flavor so be patient and cook it in batches if need be! Once beef is cooked, add in your onions and carrots. Cook them down until the onions are translucent and soft. Next add in your garlic and cook for an additional minute. Add in dried herbs and give the mixture a good stir. Next pour in your red wine. This will steam and bubble up, don't worry. It's releasing all of the tasty brown bits off the bottom of the pan. Next add in your cans of tomato and let the mixture simmer for at least 30 minutes. One pot spaghetti sauce! You can make this 1-3 days in advance. The sauce only gets better with age! if you like your sauce on the thinner side, you can add chicken stock or water to thin it to your desired consistency. vegetarian? use a good veggie stock to thin the sauce and add extra flavor when replacing the beef. you can play with your ground meat mixture too... some people like to use ground italian sausage, pork or turkey to lighten it up. if you don't have olive oil, no big deal. you can use canola oil, vegetable oil, or pam if you really want. i like using olive oil because it's italian! i find that adding a little brown sugar or port wine really gives great depth of flavor to the sauce. for me using red wine is a must but you can leave it out if you're not a fan or a big drinker. onions are another one of those musts for me... it adds SO MUCH subtle flavor to the sauce. if you hate onions you can leave them out or try mincing them in a food processor so you get the caramelized flavor without the chunks. if you see the carrots and think i'm crazy, i feel you. the first time i saw carrots in my sauce i thought my roommate had lost her mind. it ended up being SO good. which is why i've added them to my sauce. fresh herbs are always a great addition to sauce... just know that the flavor of fresh herbs are MUCH more mild than dried.